Wii-bowling can be great fun for most any age. It's not hard to play, but can still be challenging for even the most accomplished bowlers. 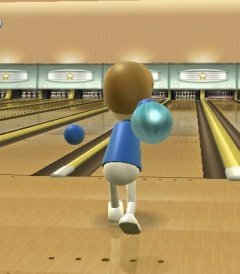 The object of Wii-bowling is to knock down the pins. You get two tries per frame just like with regular bowling. All the scoring is like real bowling, so, if you don't know much about bowling, you get to learn how bowling works. How you swing the Wii-mote will have a big impact on how the bowling ball rolls toward the pins. You can put spin on the ball, bowl the ball at an angle, bowl it slowly or fast. Bowl the ball whichever way works for you to get the best score. If you want more speed and spin, let go of the ball earlier (release B on the Wii-mote). Be careful not to let go too early or you may get too much spin. You can also get spin by rotating your wrist at the end of your swing. If you wait later in your swing the ball may actually bounce when it hits the lane. Tip: If you have 2 bowling pins left and they are lined up back-to-back, try a slow strait bowl. You can do this by making a slow swing, keeping your swing and wrist straight, and letting go of the ball later in your swing. This way the ball won't deflect as much off the first pin it hits and it will travel right through and hit the second bowling pin. Just for fun, try aiming the ball at another lane. If you get enough spin and angle on the ball, you can actually get the ball on someone else's lane. Girl Miis get a pink bowling ball, boy Miis get a blue bowling ball, and pros get a ball with stars on it. If you want a different color ball, try holding the control pad on the Wii-mote when the game starts. You can get red, gold, blue, or green depending on which direction you press.